HbsAg ELISA kit - HBsAg ELISA assay | GMP | 818-591 3030-USA. 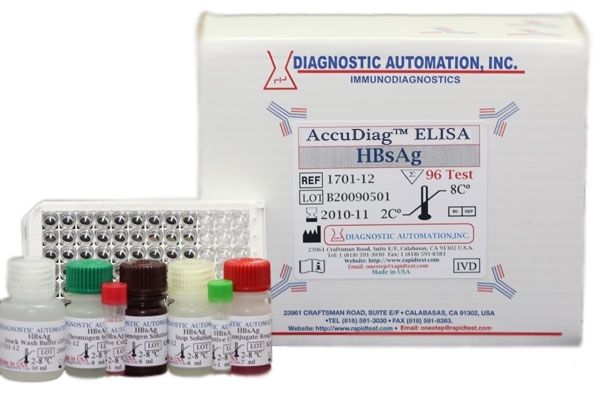 Diagnostic Automation Inc. offers an HBsAg ELISA kit, which is an enzyme-linked immunosorbent assay for the qualitative detection of HBsAg in human serum or plasma. The HBsAg ELISA Kit is designed as an aid in screening blood donors, and an aid in the diagnosis of clinical conditions related to hepatitis B-infected individuals. Hepatitis B infection is spread through infected blood or body secretions of infected individuals. Since Hepatitis B virus (HBV) is known as one of the major causes of blood transmitted hepatitis infections, blood screening using the HBsAg ELISA test is one of the most effective ways of preventing the spread of HBV. When using this kit, it is important to classify hepatitis B infection through three phases of the infection - incubation, acute, and convalescent. This can be done by identifying serological markers through each phase. Knowing the serological markers of HBsAg is an excellent method for the diagnosis and treatment of infected individuals. Symptoms of HBV infection can range from mild to severe, including chronic liver disease (cirrhosis and carcinoma). HBV is an enveloped, double-stranded DNA virus belonging to the Hepadnaviridae family. The outer envelope surface antigen of the Hepatitis B virus is HBsAg. It contains the determinant "a" and is identified in two subgroups (ay and ad). HBV has four HBsAg subtypes (adw, ady, ayw, and ayr) and has 10 major serotypes. HBsAg can be identified two to four weeks before the ALT levels are abnormal, and three to five weeks before symptoms appear. HBsAg elisa assay is one of the best methods available for either screening blood donors or in the clinical diagnosis of hepatitis B-infected individuals. The HBsAg ELISA Test kit employs an antibody sandwich ELISA technique where monoclonal antibodies unique to HBsAg, are pre-coated on polystyrene microwell strips. The serum or plasma sample is added together with a second antibody, the HRP Conjugate, (horseradish peroxidase) and directed against a different epitope of HBsAg. Throughout the time of incubation, specific immunocomplex that may have formed (indicating presence of HBsAg) is captured on the solid phase. After washing, to eliminate serum proteins and unbound HRP-conjugate, chromogen solutions containing tetramethyl-benzidine (TMB) and urea peroxide are added to the wells. Next, the colorless chromogens are hydrolyzed by the bound HRP-conjugate to a blue-colored product while in the presence of the antibody-antigen-antibody (HRP) sandwich immunocomplex. Halting the reaction with sulfuric acid, the blue color then turns yellow. The color intensity can be gauged proportionally to the amount of antigen captured in the wells, and to the amount in the sample, respectively. The wells remain colorless if the HBsAg result is negative. is probably not infected with hepatitis B virus. HBV surfaces antigen has probably been detected with this HBsAg ELISA . For additional details please refer to the instructions for use. In recent study, four methods, chemiluminescent microparticle immunoassay (CMIA), electrochemiluminescent immunoassay (ECLIA), enzyme-linked immunosorbent assay (ELISA) and golden immunochromato-graphic assay (GICA) were applied to test the HBsAg level. Evaluation of the four methods in qualitative diagnosis of HBsAg in 116,455 specimens showed no significant discrepancy among four methods tested and ELISA kit was identified to be suitable for the qualitative diagnosis of HBsAg. Ref: Liu et al., J Virol Methods, Feb 2014. Searchable names for HBsAg elisa kit:anti-HBsAg; Buy HBsAg elisa kit; Hepatitis B Surface Antigen (HBsAg), ELISA Kit 1701-12 datasheet at Diagnostic Automation; anti-HBsAg; HBsAg; anti-Hepatitis B Surface Antigen (HBsAg); Hepatitis B Surface Antigen (HBsAg) ELISA Kit; hepatitis B surface antigen; ELISA Kit for Infectious Disease; HBsAg elisa kit; anti-HBsAg.